That is where we will probably be moving in a few months. I don't know a soul in Iowa and the thought of moving there excites me and terrifies me all at once. Jon and I feel good about the idea of moving, but it is hard to leave our families behind. We have never lived far from family and so I know that will be hard for us. If anyone has any good tips for moving a long distance or finding a house and getting settled in a place where you know absolutely no one...it would be most appreciated! Oh, and being THREE HOURS away from a temple! I've always had a temple within 10 minutes of where I live. That is going to be hard. 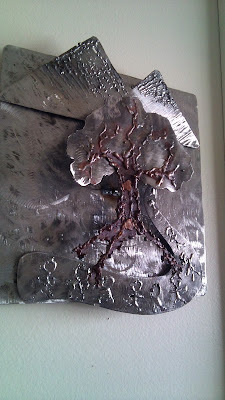 When I showed you our homemade Christmas gifts I forgot to show you the gift Jon made for me. He welded me a sculpture (out of an old cookie sheet) to portray the poem I wrote, "My Life is a Tree, not a Path." 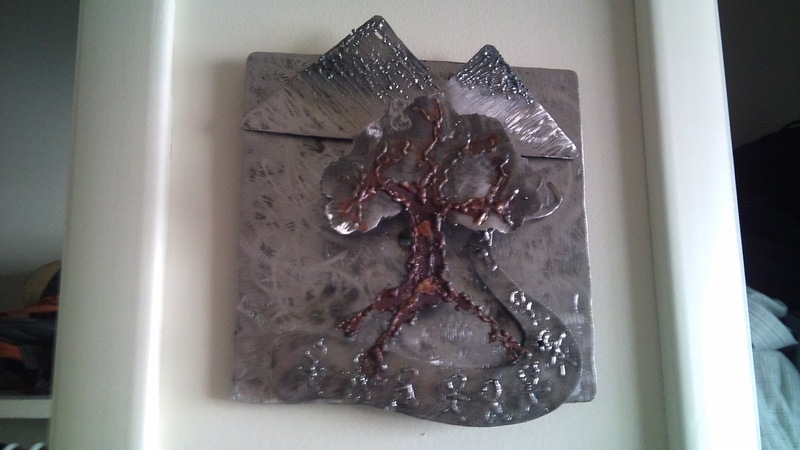 The tree is welded on showing that it is firm and eternally constant, while the mountains and the people on the path are held on with magnets, indicating that worldly ideals of success are changeable and oh so very fleeting. He totally surprised me with it and it made me cry when I figured out what it was. It is hanging in our bedroom now and I love the beautiful reminder is to me that my possibilities to grow really are endless! Can I just say that I am ready for summer. No, and it isn't because I am sick of the snow, even though we did get TWO feet in one storm a few weeks ago. It is because I really hate folding socks. In the summer everyone (except for Jon who has to wear shoes to work) wears sandals and so I hardly have to fold any socks. But in the winter there are five people who wear seven or eight pairs of socks each week and that turns into a big pile and I just hate folding them. I don't know why. Maybe it is because they never all match and so after the hard work of sorting through a bazillion socks I still have a pile of socks with no mate. It just feels very unsatisfying. So here is me wishing that sandal weather in Iowa starts really soon... at least sooner than May. A girl can hope right? Oh, I love this music video. It was my week to post over at The Gift of Giving Life. If you ever wanted to know more about doulas and what we do, and how we are a lot like dolphins you will appreciate my post. And if you want to hear a beautiful story about an amazing woman and her little boy, Caleb, you will want to read this. Their story is inspiring! I've lived 4 hours from the temple for most of my life. You just go once a month and do sessions all day long. Hopefully you can find friends in your ward who wouldn't mind trading kids on the weekends. I just gave my baby her first bottle so I can start going to the temple again. We only live 45 minutes away. For the tiny socks I keep them on a giant safety pin. My husband folds his own socks. Why does the church encourage couples to have tons of kids and then FORBID feeding them outside of the Outer Darkness (stinky, windowless changing/nursing closet) or the bathroom? You would think that church would be more baby friendly. Did someone tell you not to nurse your child in Sacrament meeting or any other meeting? Because they are wrong - you can nurse your child anywhere within the building that you see fit. I usually nursed in the foyer because it was just easier with other kids, and the couches and chairs there are super comfy (at least in my building). Where you nurse should be about your comfort level, no one else...sorry, I will get off my soap box now. My mom asked me not to. She is in the RS presidency and told me that it makes everyone uncomfortable. I used a cover before that. Outside of church I don't use a cover and I nurse anywhere. I am just peeved because I had to leave sacrament to calm Otsy down/nurse her and had to miss out. again. I haven't had the sacrament in weeks because of the baby. Forget that. I am getting out my cover and nursing wherever i want to. I am so sick of spending all of my meetings in that diapery little room. Oh Heather! Congratulations on the move! I hate moving, but I love the meeting new people part, and setting up a new house. We have a man/family in our ward who are Iowans! They loved it and miss it and it is obviously very dear to their hearts. Look on lds.org website and locate the local ward buildings, live close to it. I cannot tell you the benefits of living by the ward building where the children can just walk to and from the building by themselves for scouts, activity days, seminary, mutual, church....we pretty much live there so you might as well save your gas driving to and from. We too live four hours from the nearest temple. Trading with another family (suggested above) is a great option. Also, our temple has a list of families willing to babysit during sessions or offering rooms to sleep over for those who have to drive from afar. I don't know if other temples do that, but ours has a list. And the best moving advice ever: As the last box, pack one pot, one spoon, one sharp knife, a can of chili (or other easy, one pot kind of dinner), zip-lock baggie or box prepared mix of corn bread, pan to cook bread in, small peanut butter and jelly, one kitchen towel and wash cloth, a tiny little dish soap, paper plates/bowls/cups/napkins/plastic silverware, and the can opener. Label the box: open me first!! Then when the kitchen is a disaster, everything is in boxes, and you arrive late in the evening from a day of travel, and maybe even something didn't get turned on, you have a little, identifiable box that will easily feed your little ones things they find comforting after a very difficult day. And make sure you have called ahead to have all the utilities turned on the day before you arrive! So nice to have hot water and light. And I forgot to tell you how beautiful I think your sculpture is. Jon did a great job!! Beautiful and special! Moving is a wonderful adventure - I have done it my whole life! I have never lived closer than an hour away from a temple (so totally jealous that you currently live 10 minutes away). 1 - If you pack yourself, pick a different color for each room. Every box you pack will have one of those colors on all 4 sides of the box. YOu can use markers or stickers. ex. : yellow = kitchen, blue = bathrooms, green = living room, etc. This way when you get to our new home, you can tell whomever is lugging in the boxes exactly what area of the house you want the boxes to go. 2 - Every box you pack should also have a number on each side. The number corresponds with a numbered 3x5 card. Each numbered 3x5 card then lists all the items in the box. The more detailed the list, the easier it is too find items when you move in to your new home. For example: box 1 has a yellow sticker, a 3X5 card w/ the number 1 & a list that says: children's platic bowls, plastic glasses; plastic plates; cookie cutters; plastic pitchers, plastic collander, etc... Then when you move in & the little ones are asking for a snack you know exactly where there dishes are...no opening up a ton of boxes in the hopes of finding a suitable glass & plate. This tip also works great if you ever have to put stuff into storage. 3 - As much as you are going to miss your family, try to keep reminding yourself: this is home (Iowa) and I love it. Immediately start looking for things that you love about your new hometown. It helps a lot. The times I have done it, I fell into our new life so much quicker. The times I haven't...well, some of my darker days & moves. Good luck with the move!Wish I was close enough to help - I love packing! Heather, I have an aunt and uncle in Ames. I will have to get their contact info for you. It has been a while since I visited Ames but I really liked it. It is much flatter than what you are used to but a nice community. I just recently found your blog and have enjoyed reading some of your posts. I was excited to see that you are moving to Iowa! My husband and I (and our 2 sons) live in Iowa City. We love it here. And yes, you will be wearing sandals before May. We live 2.5 hours from our closest temple (in Detroit) and like someone else said, you just go once a month and do work all day long. A LOT of wards who are in situations like this are really good about setting up special ward temple trips, you can get the YW in the ward to babysit as Personal Progress experiences (it would be especially cool for them if you could tell them what it really means for you to be able to GO to the temple and why it's so important to you...maybe in a letter to the girl watching your children? ), etc. It works out. For me, I think it actually makes me MORE receptive to the Spirit while I'm there because I only get to go twelve times a year, you know? I think it makes it more special and more of a privilege (not that you take the temple for granted- OBVIOUSLY, given your writings about it!- I'm just saying that for US, temple attendance is a special experience. Good luck with your move! I've moved several times in my life, all to places I'd never been before or where I didn't know anyone. It IS scary AND exciting. I'm sure you'll do amazingly! Just name-drop the blog a lot! lol. I lived in Iowa City during my PhD years and grew up in Minnesota, where the favorite pastime was making fun of Iowa. Which is funny, since they're really not all that different! Prepare yourself for cold, cold weather. You've lived in Logan but it's different in the Midwest. More intense, more gray and gloomy, no bright sunshine all the time to make you feel less depressed about being freezing cold. Summers are crazy humid and there are lots of insects. Honestly, I get to the temple 1x a year if I'm lucky. (The Chicago temple is 3+ hours away). Pregnancy and nursing mean I can't get away much. And actually it's fine with me. There are seasons for everything and right now I'm in the raising young kids season of life. Plus I have some issues with several things in the temple--the sexist parts cause me more and more pain the more I go--and so I don't miss it all that much. I really enjoy your blog! I have been reading it for a while and love all your insights to the scriptures. Having moved from Utah, to San Fransisco then off to Vancouver,BC, then back to the states L.A and Washington State, I understand all too well moving to a place you know nothing about. My kids were very young the first time when we moved so I have lots of experience with what you are feeling. 1. All the places we have lived I found using Craigslist. Its a great way to know what homes/apts rent for in that area. Never buy right off, its always best to know the housing market in that area first. 3. once you find a place to move too look on LDS.org for the ward you will live in, contact the bishop and let them know when you are moving up so they can be ready to help. 4. Get rid of as much stuff as possiable, make your move easy. What ever you pack you will have to unpack too. 5. Breathe!! Love and hug your kids and love the adventure of it all! About the socks, I pay my kids to fold them. I started at around 4 yrs old, its a great way to teach them about matching and money and they think its fun! I second the advice to contact the local bishop. We tried it for one move, and while he wasn't aware of any open housing in our price range, he was willing to tell us about the neighborhoods and where we would be safe, etc. If the bishop doesn't know of anything ask for the relief society president's name. And I also second the idea of getting your kids to fold socks. My mom and I would deal them out like playing cards and play "Go Fish" with them. We always had so much fun! My husband and I lived in Ames about three years ago. You will love it. The ward is full of wonderful people and Ames itself is a very friendly place. I wouldn't worry about the distance of the temple--it will just encourage you to take your family to Nauvoo which will make for some pretty awesome memories. (It is not technically your temple district but is just as close). I think there was only one ward in Ames as well as the student ward, which means ward members are spread out. There are a good number of families that come because of Iowa State. You didn't mention if you were planning on renting or buying a house. Either way I would suggest you check to see how close a train track is. The trains DO go through the town, and if you have light sleepers you won't want to live too close. There is even a modern dance company there...but I have to warn you it is a little wonky. I am truly excited for you. We have lived in four states since Iowa (including Hawaii) and both my husband and I would put Iowa at the top of our list of places to live. How exciting! A new chapter! We've moved a few times as well! CA, UT, AZ, CA, Virginia, and now Minnesota! It is a little hard and scary moving away from family, but it will redefine your family in ways that you can't imagine now. I've also used Craigslist to find housing, and found that helpful. Once, My husband saw the property because he was in town for an interview, another time, we had someone look at it for us, and we did it all through email and phone calls - the landlord had moved out of the area, so we never met him! A woman in my ward in VA had moved all over the country, and Iowa City was her most favorite place of all! (I just googled it and found on wikipedia that Ames was ranked 9th best place to live in 2010! )So, it will be an adjustment, as moves always are, but you'll bloom where you plant. I LOVE Jon's Christmas gift! How special and amazing! I second Carin's "open me first box". She made one for me when we left CA for VA, and it was a lifesaver. I would add a roll of toilet paper, cereal and a carton of shelf stable milk, so you have breakfast the next morning. Knowing where the can opener is immediately is REALLY helpful! I've had it missing for a week during a move and that was for the birds. That sculpture is amazing!!! What a wonderful gift. Iowa, that is SO cool. I have a cousin that lives somewhere in Iowa, I'll find out where. I also don't match socks. The kids go in one drawer near the shoes. The others go in a drawer for Rob and I. So excited for your family's upcoming adventure eastward! I have never lived in Iowa, but I've lived in Illinois, Missouri, and Kansas. There's a lot to love about the Midwest. I actually got to really like the humidity, because it made everything so GREEN! Moving back west, where it's only green if you pour water on it, was an adjustment for me. Having the temple far away is a bit more of a sacrifice, but you can find ways to make it work. How exciting to be starting this new adventure! I definitely agree that coding each box based on what room in the house it should go is very helpful. I wrote on each box, but the helpers that moved things for us didn't all necessarily read each box. Using color would have helped a lot. Maybe use a small piece of colored tape so you don't have to open and close colored pens each time and take the time to 'draw' a big mark. Even so, it definitely expedited the process of finding things! As for the socks...I've started something recently (I honestly don't remember it all the time, but I try to keep on top of it...). I bought a lingerie bag for each member of our family and when their socks are dirty, they get put in their own bag. So when they all go through the laundry, 1) they don't get eaten by the washer/dryer monster and 2) they're so much easier to find and sort! I buy ~3 bags of identical socks for an individual family member (at least for the adults whose sizes won't change!) at a time so that when 1 gets holes, I can just throw away the 1 and not a pair...eventually another one will get thrown out and I'll have an even number again. It's also a lot easier to match 20 identical white socks than 20 white socks that are all different types (ugh!). When I was a kid, my mom would sometimes have "clothes folding parties" during TGIF night where we'd watch those shows from 8-10pm Friday night together. Sometimes we did it on my parents' bed and sometimes in the living room. Just calling it a party got me to want to help and have fun because it was a family affair. ;) I'm sure it helped that I was doing something I considered fun (watching TGIF with my family) at the same time. Also, I *love* that music video! Thanks for sharing! I live an hour north of Ames in Fort Dodge. We will be in the same stake! This will definitely be an adjustment, but our family loves it here. We've been in Iowa for 7 years now, and don't have any plans of leaving the state. Maybe a different city, who knows? Let me know if you have any questions! Hi! I just found your blog and subscribed to your feed. Got this post in my reader and thought I'd let you know that my sister used to live in a small town near Ames while her husband was in vet school. She said the people were amazingly friendly and helpful. As soon as they moved in her neighbors were over volunteering to help them with big projects and were just always very friendly and helpful. Much more so than out West. She got the cutest house that was very old and had lots of beautiful wood trim and wood flooring that she refinished. She was sad to have to leave it when they moved back West. Hope you will enjoy it there! What an exciting adventure! Moving away from family can be hard but will also be a wonderful blessing in uniting your little family. We have loved learning to be our own little family unit and to love and depend on friends and ward members. Good luck with the move and finding a house! (I HATE finding a place to live. Especially far away. I usually pray a lot and then go with my gut with what house feels right!!) And on a very random note....the main character from my FAVORITE movie of all-time, "What's Up Doc?" - is from Ames, Iowa!! If you haven't seen it you should, it's hilarious.